A frequent topic in film circles is the role of criticism in a changing online world. It’s become a challenging profession with limited full-time positions, but many are still interested in the craft. Meanwhile, movies like Birdman depict a critic as a powerful villain who cares little for art. The argument that critics are failed artists remains prevalent despite having little connection to reality. 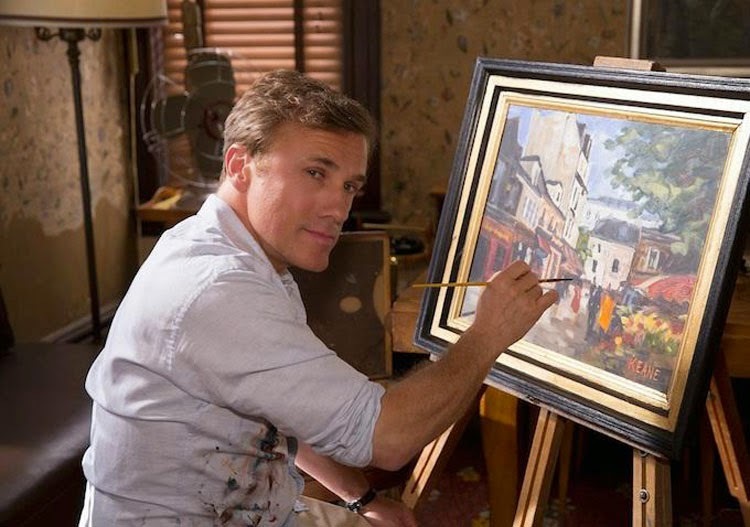 This idea comes directly from the mouth of Walter Keane (Christoph Waltz) in Tim Burton’s Big Eyes. When the art writer John Canaday (Terence Stamp) questions Keane about the value of his paintings, he gets overly defensive and spouts the familiar rhetoric. Of course, this situation is very different. Keane is a fraud who’s taking credit for his wife Margaret’s (Amy Adams) paintings and earning a fortune. Hearing this line from a masterful liar complicates its meaning from the usual attacks that filmmakers take at critics. Canaday is a snob with traditional ideas about what constitutes art. On the other hand, he recognizes something fake in Keane beyond not having the keys to the right social club. 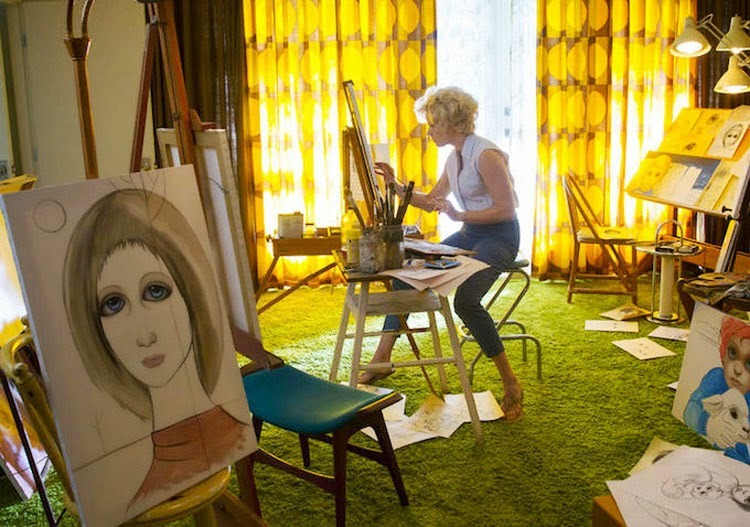 Canaday plays a small part in Big Eyes, but his presence connects to the idea of art reaching a new stage of existence. Keane was a fraud yet knew how to sell Margaret’s work to huge crowds. Instead of letting it hang in art galleries for a select few, he sold her paintings in grocery stores and gas stations. That conflict between art and commerce is still present in our modern film culture. The Oscars claim to represent the greatest achievements in movies, but they’re really a commercial venture bought through expensive marketing campaigns. Rotten Tomatoes numbers are presented like sports scores and often lose sight of the words behind them. Gatekeepers at studios are still looking for the biggest commercial hits, regardless of the artistic merit. This is old news. Keane is a marketing superstar who could find a job at any wealthy corporation; he just happens to be selling his wife’s art. The fact that he’s taken ownership of the material is a vain way to sell his self-importance. Keane isn’t content to be the man who discovered a new way to get rich with art. His goal is being recognized as one of the greats. The interesting part is that Burton doesn’t seem that engaged by the themes I’ve just described. The ideas are present in the story of Walter and Margaret, but Burton prefers to tell a more personal tale. Margaret’s struggle to overcome her domineering husband and escape is the driving force. It’s a well-paced and lavish period piece that works because we’re invested in her success. The main reason is the fine work of Amy Adams, who injects so much heart into the timid character. She makes us desperate to see Keane get his comeuppance, and the reward is worth the wait. Adams finds soul in a character that could be frustrating. Writers Scott Alexander and Larry Karaszewski also worked with Burton on Ed Wood, and they ensure that we never stray from Margaret’s side. When she finally gets the chance to show her worth, it’s a well-earned victory against an evil clown. Waltz plays Keane as a man so committed to the lie that he seems to convince himself it’s the truth. He raises his voice and yells fiercely when questioned to ensure people won’t consider alternatives. Despite passionate work from Waltz, there’s a risk this villain could become a cartoon. When he terrorizes Margaret and her daughter Jane (Madeleine Arthur) in a drunken rage, the performance nearly goes too far. His drunken stupor channels Robert Stack in Written on the Wind, and this isn’t really a Douglas Sirk melodrama. Another challenge is the possible sitcom plot device of supporting characters venturing close to discovering the truth but never quite getting there. One scene with a suspicious friend DeAnn (Krysten Ritter) becomes silly as Keane appears out of nowhere to angrily sell the charade. Adams’ genuine presence keeps us on board, however. The questions never become too strong because she sells Margaret’s humanity. Waltz also finds clever ways to reveal the subtle manipulation from Keane, particularly in the early scenes. When he learns that Margaret has never been on a plane, he whisks her off to Hawaii and tries to make everything perfect. Once the trap is strung, it will take years before she’s willing to give up on the relationship. Big Eyes is a surprisingly direct movie for Burton, who rarely takes a straightforward approach to any story. He’s surely faced the challenges of creating art in a commercial marketplace during his long career. It’s easy to identify with Margaret, who's betrayed in the most personal way imaginable by her own husband. He makes her complicit in the lie and sets up a scenario where coming clean isn’t easy. Their expensive home becomes her prison while he cavorts with stars and becomes a celebrity. The shot of Jane discovering Margaret passed out on the floor beneath a giant painting says plenty about her situation. Her creative outlet is now a vice that keeps squeezing with every new scheme from her husband. Burton gives Adams room to shine and creates his most engaging movie in a long time. I knew little about Margaret’s real-life story before seeing this movie and am intrigued to learn more. She’s alive and well at 87, and this film presents her great triumph with charm and grace. I'm glad to read that you liked this one. It made its way onto my Top 10 list from last year but it seems to have been dismissed by a lot of people. I thought Burton did a fabulous job creating something so outside of his normal box. And the two lead performances were spot-on. I loved Waltz's performance and I understand the criticisms about it becoming too much. But I think it fits their characters perfectly. Margaret is quite and reserved, something very clear in Adams' performance. Walter is showy and combustible, something reflected in Waltz's performance. It really worked for me. I wonder if there were just too many films out in December. I feel like Big Eyes wasn't even discussed that much, and part of it may be Tim Burton's involvement. His reputation isn't what it once was, and that's too bad considering what he accomplishes with this movie.